File/Small wind farm near Arlington, WY. Dozens of people testified against the bill, while no one spoke in favor of it. Most of the arguments boiled down to the idea that raising the tax would make Wyoming wind uncompetitive. “The timing could not be worse for this discussion,” said Roxane Peruso, vice president and general counsel for Power Company of Wyoming, which is developing the Chokecherry-Sierra Madre wind project, the largest proposed on-shore wind project in North America. Power Company of Wyoming started building roads for its project in early September, but Peruso said whether construction on the project would continue hinged in part on the committee’s vote. Other developers echoed that sentiment. Cameron Stonestreet with TransAlta, a Canadian energy company, said the discussion about raising the wind tax gave his company pause when considering further investments in Wyoming. Paul Martin, president of Intermountain Wind, which is developing a 170-turbine project in northern Albany County, told the committee that if Wyoming raised its tax, it would price wind developers out of the state. “They will go elsewhere,” Martin said. Wyoming is considered one of the best wind producing states in the nation because of its consistently high wind speeds, but no new wind farms have been built in the state since 2010. Those testifying pointed to various reasons for that, including transmission constraints, the state’s tax structure, wildlife protections and the national economic downturn. Wyoming has effectively maxed out capacity on its existing power lines, and new transmission capacity has been slow to develop. The state does not have a corporation income tax, but in addition to the 2010 wind production tax, Wyoming ended the sales tax exemption on wind energy equipment in 2011. Beyond wind developers, many local governments and trade associations expressed concern that increasing the industry’s tax burden would kill new wind projects. “We have no jobs, we have no business. All we have is wind,” said Karen Heath with the town Medicine Bow. The Wyoming Stock Growers Association, the Wyoming Contractors Association, the Wyoming Taxpayers Association and a number of economic development corporations also spoke against the proposed bill. Sen. Cale Case, R-Lander, expressed skepticism that a tax increase would affect development in the state. He asked committee members to consider the impact of thousands of turbines on viewsheds for future generations of Wyomingites. “One or two wind turbines is cute. Thousands—not so much,” he said. Want to know more about the arguments for and against raising the wind tax? Read our story. Learn more about Wyoming’s transmission problems. Demand is growing for skilled wind turbine technicians. Students at the Laramie County Community College want to fill those jobs. Where do wind turbines go to die? We investigated. 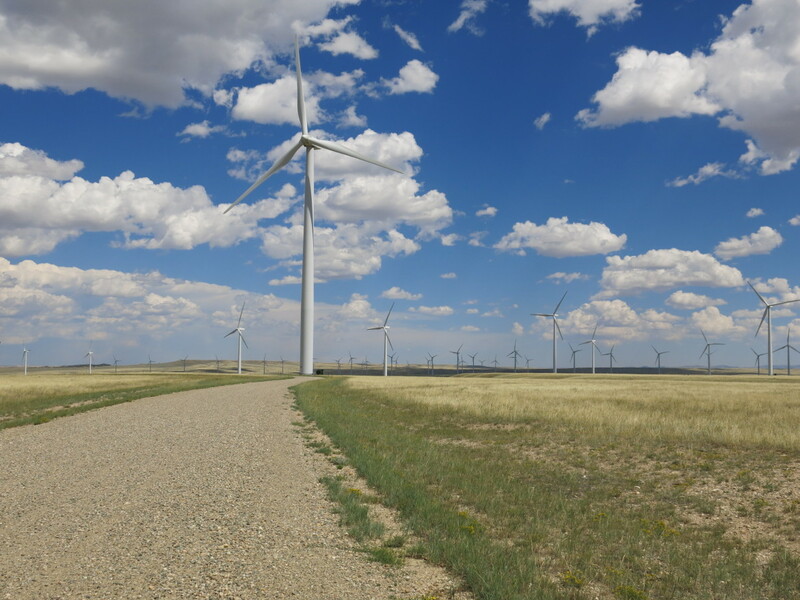 The future for Wyoming’s wind industry is finally looking up. There are few places in the country with more wind energy potential than Wyoming, but the state has seen almost no new wind turbines built in six years, even while wind has boomed in the rest of the country. Depending on who you ask, the challenges have been political, technical or both. But now, the outlook is improving on all fronts.